It’s pretty difficult to believe that it’s been 20 years since Shakespeare in Love graced the cinema and reignited people’s passion for Shakespeare, the man often considered the greatest writer of all time. The film went on to win 7 Oscars, including Best Original Screenplay for Marc Norman and Tom Stoppard, Best Actress for Gwyneth Paltrow, Best Supporting Actress for Judi Dench and Best Supporting Actor for Geoffrey Rush. John Madden was nominated for Best Director. Based on his own original idea, Norman wrote the first two drafts of the screenplay then set up the project at Universal. When Miramax took over the project, they added the playwright Tom Stoppard into the mix. While most writers are less than thrilled when their script is given to another writer, Norman had a different take. “Tom got interested in the project, and how do you turn down the foremost playwright in England?” Norman told the Los Angeles Times. I was lucky enough to study with Marc Norman at UCLA; he told many juicy tales about the film including the fact that Julia Roberts was originally attached to play Viola (Paltrow’s role), but after conducting casting sessions in the U.S. and London, they couldn’t find an actor to play Shakespeare. Roberts even flew to Ireland to meet with Daniel Day-Lewis, in hopes the My Left Foot-star would play the bard. After their meeting, however, Roberts flew back to Los Angeles and dropped out of the film. Not even the “pretty woman” could convince Day-Lewis to star opposite her. We’d have to wait 10 years before the film would get its dream cast that included Joseph Fiennes as Will Shakespeare and Paltrow as Viola. Paltrow’s casting forever ruined the friendship between Paltrow and actress Winona Ryder. Paltrow saw the script on Ryder’s desk and called her own agent to get an audition. Paltrow got the role and the Oscar. Many would argue the loss of a friend is a small price to pay. Gossip aside, there is so much to learn from the writing in this film. So many of the dialogue exchanges are masterfully crafted to include many pieces of dialogue from Shakespeare’s own characters from various plays. Let’s take a look back at some of the incredible scenes that made this love story a modern-day classic. This scene is a parallel of the balcony scene from Romeo and Juliet and feels cleverly familiar. It’s no surprise Will, inspired by his meeting with Viola, goes home and burns the midnight oil writing R&J, the story of perhaps the most famous lovers in all of history. Viola: (to Nurse) Anon, good nurse, anon. (to Will) You’re master Shakespeare? Will: I am a lowly player. Viola: Alas, indeed. I thought you the highest poet of my esteem and writer of plays that capture my hearts. Will: Oh, I am him, too. Bonus points: The Nurse and Will meeting on the balcony: Aaaahhhhhhh! 2. “She’s been plucked” scene with Elizabeth, Viola and Lord Wessex. Viola becomes so real and relatable in this scene. How many teenage girls have you heard gush about how much they love the theatre? She is just like a young woman we all know. This is masterful character writing. I also love how observational and blunt the Queen is, making her power known in every way possible. Elizabeth: (to Lord Wessex re: Viola) Have her then, but you’re a lordly fool. She’s been plucked since I saw her last and not by you. Takes a woman to know it. Elizabeth: They are not acted for you. They are acted for me. In the Elizabethan era, women were prohibited by law from acting because, despite the theatre’s popularity, it was seen as a disreputable endeavor. Most actors weren’t even allowed burial in Christian cemeteries. That’s what makes the story of a noble woman’s dream to perform onstage so exciting. She’s such a great actress, in fact, she’s able to pull the wool over everyone’s eyes. Well, almost. Queen Elizabeth (Dench) is ever the scene-stealer and carefully navigates her message to Thomas/Viola that she knows the truth but is going to look the other way. Queen Elizabeth: But I know something of a woman in a man’s profession. Yes, by God, I do know about that. Mr. Tilney: That woman is a woman! Viola is dressed as Thomas, her male alter-ego. Thomas has just told Will that Viola has been promised to Lord Wessex. This scene is delicious because the audience knows that he is she, and the fun is waiting for Will to discover the truth. My favorite part of the scene is when Thomas fishes for Will’s true feelings for Viola. Viola: Tell me how you love her, Will. Will: Like a sickness and its cure together. Bonus points: The boatman discovers Will is a writer and asks if he’ll read his own manuscript he’s presumably written in between river journeys. All these years later, this scene still brings tears to my eyes. Perhaps it is the adult nature of their response to the news that Will and Viola will never see each other again. Passion is expressed along with love and remorse, but there’s no childish wallowing in self-absorbed sadness. They accept their fate and Will turns the truth into one of his greatest plays Twelfth Night, or What You Will. Viola: The Queen commands a comedy, Will. For Twelfth Night. Will: A comedy. What would my hero be? The saddest wretch in all the kingdom? Sick with love? Will: Sold in marriage and half-way to America. Viola: At sea then. A voyage to a new world. Will: A storm. All are lost. Viola: She lands, on a vast and empty shore. She’s brought to the Duke. Orcino. Viola: But fearful of her virtue, she comes to him dressed as a boy. Will: And thus is unable to declare her love. Viola: But all ends well. Will: How does it end? Viola: I don’t know, it’s a mystery. Will: I’m done with the theatre. The playhouse is for dreamers. Look what it has brought us. Viola: It was we ourselves did that. And for my life to come, I would not have it otherwise. 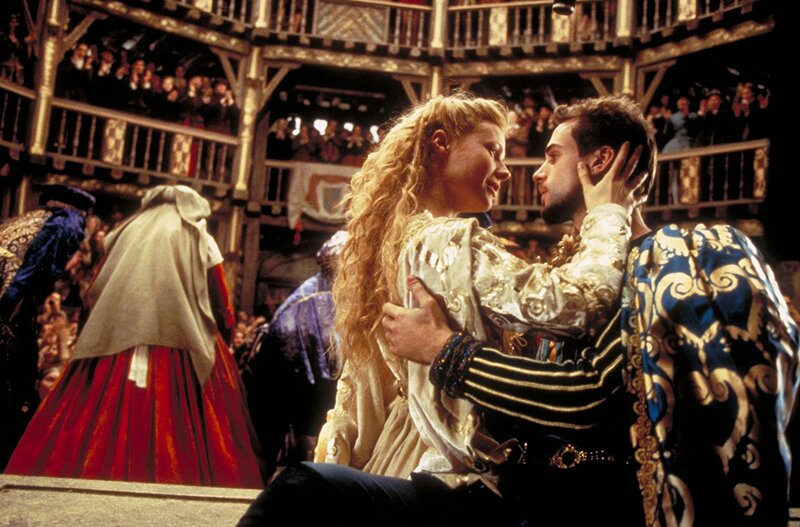 What is your favorite scene in Shakespeare in Love? Let us know in the comments section below. 7 Replies to "Shakespeare in Love turns 20: A look back at the 5 best scenes"
It’s NOT supposed to be Queen Victoria. It’s Elizabeth I. Sorry but it is not Queen Victoria, but Queen Elizabeth I. Judi has played them both, of course. Shakespeare in Love is one of the greatest films ever made. It’s in my top five. Back then I was interested only in Sci-Fi/Fantasy and Horror. Then, while working at a movie theatre, I watched the first fifteen-or-so minutes of Shakespear in Love during a break. It was so good I saw the entire film that day. I loved it. My taste in movies changed forever. I have two favorite scenes. The first was the ending. Twenty years on and it still touches the heart. Beautifully written and acted. My second is when the boy playing Juliet loses his voice, and Will is in a panic. Who will play the part? Then…. “How now, who calls?”. Viola steps out on stage, and the look on their faces when they look at each other is priceless. Mr. Fennyman, let me explain about the theatre business. in the ups and downs of owning a theatre. Nothing. Strangely enough , it all turns out well.